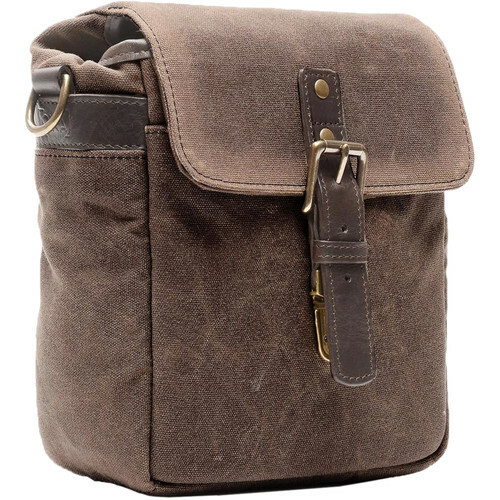 The Bond Street Waxed Canvas Camera Bag in oak from ONA is a stylish carrying option that can accommodate a mirrorless camera with one or two lenses and additional personal items. For impact and shock protection the bag has a padded non-scratch interior with closed-cell foam. A touch-tab divider can be adjusted to create two interior sections of equal or varying lengths. With or without that insert, the Bond Street bag can also be used as a compact messenger bag. Secure the contents with the front flap which has a sturdy brass buckle and a tuck lock. Your smartphone, lens caps, memory cards, or camera batteries can be accessed quickly from the bag's spacious rear slip pocket. A long strap provides the ability to wear the Bond Street Waxed Canvas Camera Bag over your shoulder or cross-body. The strap has brass swivel snaps so you can detach it when you want to place the bag within a larger container or case.